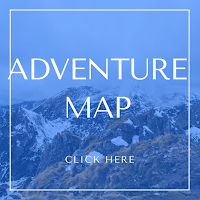 Backpackers planning on hiking into the scenic area have two different trails to chose from: the East Fork Smiths Fork via China Meadows OR the East Fork Blacks Fork trail via Bald Mountain. The first option is the most popular, and follows the river all the way to its source. It is very well maintained and has a total elevation gain of only 1,280 ft. The Bald Mountain route, on the other hand, is more strenuous. It begins at East Fork Blacks Fork (also known as the Cache Trailhead in some guides), and climbs over Bald Mountain before dropping down into the Red Castle Basin, gaining 2,959 ft. 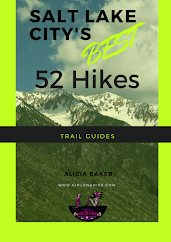 Both trails are within 1/4 mile of each other, yet the elevation gain and different starting points will ultimately force the hiker to chose a route. Another option would be to take both trails by doing a thru-hike by dropping one car at the East Fork Blacks Fork TH, hiking into Red Castle, then exiting via China Meadows where another car would be waiting for you. This would require a car drop (or swapping keys with friends mid-trip), more planning, and figuring out logistics for getting your car back. The drive between both trailheads are roughly 2 hours. Because my partner and I try to avoid crowds and prefer more solitude, we opted for the Bald Mountain route. We had also heard that this route would be more scenic. 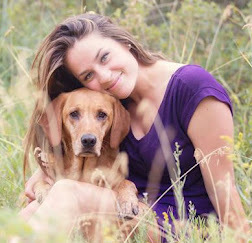 Those three things solidified our choice, and we couldn't have been happier with it. Though this route gains more elevation, it is compensated for by the amazing views across the exposed, and above-treeline, route. From SLC, head East on I-80 past Evanston, WY, and take exit 30. turn right, and follow County Rd 207. This will quickly turn to a dirt road, but is passable by a small, compact car. You should see many solar wind towers on your left. In 2.6 miles, turn left again, continuing on County Rd 207. Drive another 6.4 miles until you reach the stop sign, and turn left/straight, and you will now be on County Rd 204. Drive 2.6 miles, until you see the brown sign for East Fork Blacks Fork and turn right. You will now be back on a paved road, County Rd 271. 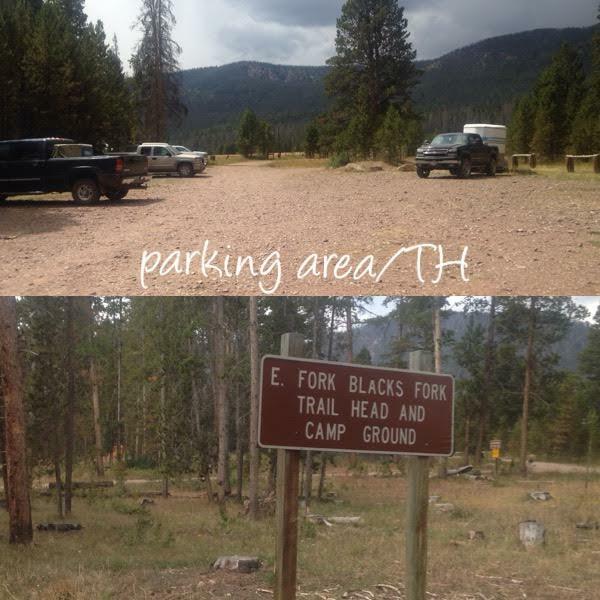 Drive all the way past the Uinta County Youth Camp, following the signs for East Fork Blacks Fork, until you reach the very end of the road, where the TH and campground is. The last 6 miles of this road is the roughest, but even my little Sonata made it (slowly at 10 mph). Here is a map link. About 1/2 mile before the official TH, you will see a sign on your right that says "Red Castle" pointing left. DO NOT take that dirt road (We originally went down this road and it doesn't lead to anything and it very rutted out)! Just continue straight to the end of the road to the official TH. There is one vault toilet. The official TH and campground at are the very end of road FR361. I didn't see anything about there being a fee to camp here, if you planned to do that. There are enough parking spaces for roughly 20 cars and about 10 horse trailers. This is where you'll want to park and start hiking from. The trail begins by crossing the bridge, over the river. 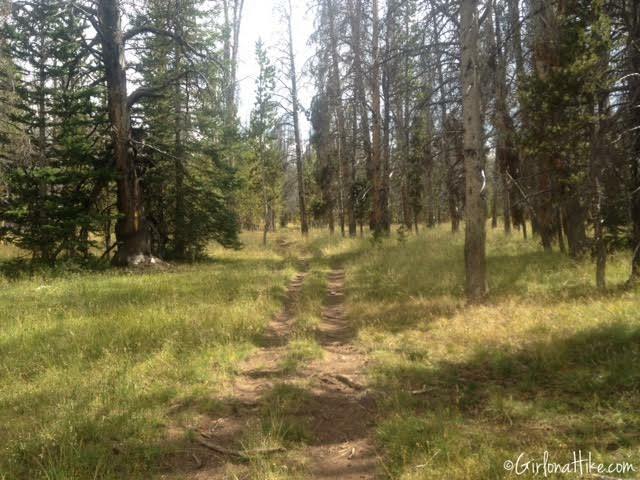 Following the trail signs, you will eventually be hiking North for 1/2 mile through grassy, flat land. 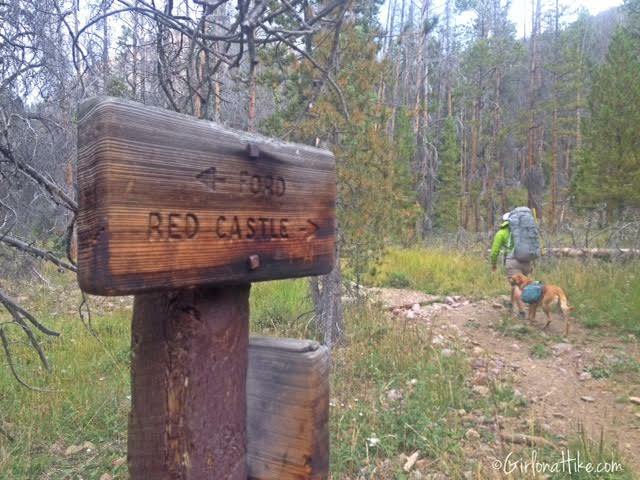 After the first 1/2 mile you will see the sign for Red Castle, and turn right. The Ford to the left, is if you wish to cross the river, but I don't recommend doing that. The river is almost always knee to thigh deep, and can be dangerous to cross, especially with a heavy backpack on. Once you reach this junction, the trail begins to gain steady elevation for the next 3 miles. There are about 5-6 very long switchbacks that help you gain most of the elevation. After reaching the top of the ridge it temporarily levels out and meets the Bald Mountain Trail junction, but it is NOT signed. Stay to the right at the junction, and the path begins to climb elevation again. Within 1 mile you will be above tree line. To the right of the trail, you will see Bald Mountain (11,776 ft), which is the large, gentle sloping dome ahead of you (not pictured). The trail leads you to a nice overlook of Bald Lake. Though it seems close and like a good, possible camp area, it is actually 500 ft below you, and therefore hardly visited. 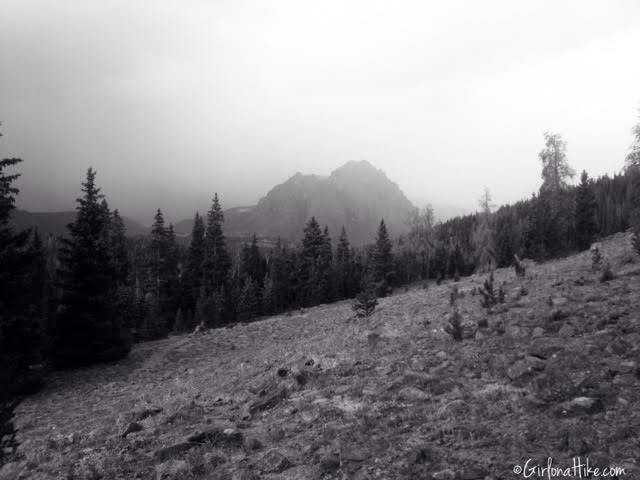 The highest point on the trail is roughly half way to Lower Red Castle Lake. At this point, you could summit Bald Mountain - drop your pack and hike up roughly 300 yards to the right (West) to the summit and claim your peak bagging status. From Bald Mountain, the trail meanders across this open, exposed ridge for another 1.3 miles. 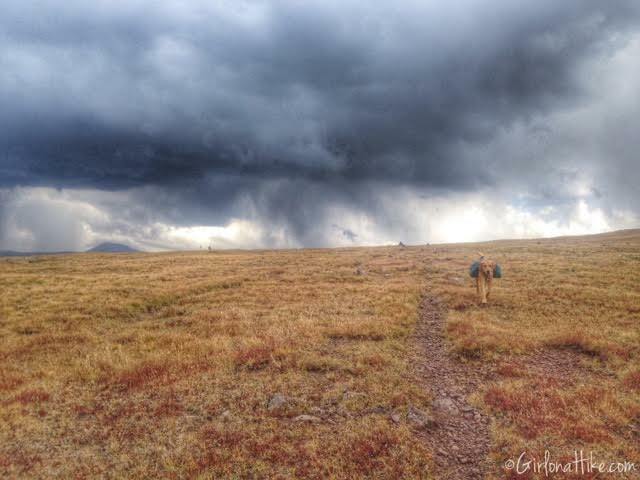 This section of the trail can be very windy and cold, since it is above treeline and fully exposed. I was really glad I have my FitnessFox Headband with me! 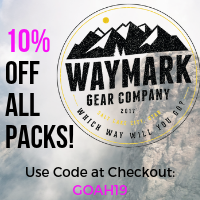 Not only do they keep my hair from flying in my face and the sweat out of my eyes while backpacking, this time they helped saved my ears from freezing off! They don't sell this pattern anymore, but they have lots of other cute styles to choose from. 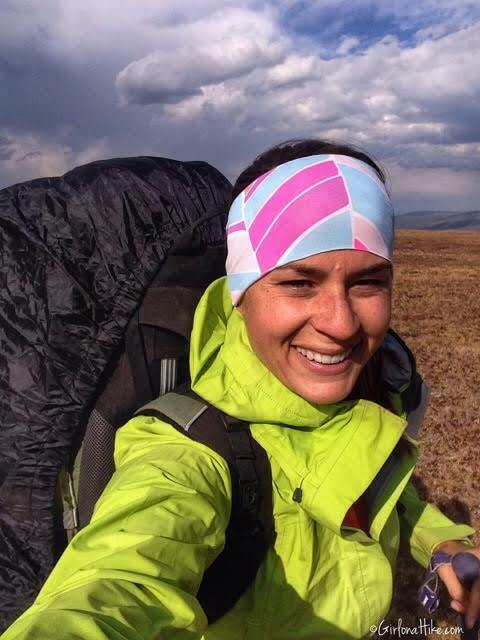 Learn about what I wear while hiking in cold weather! 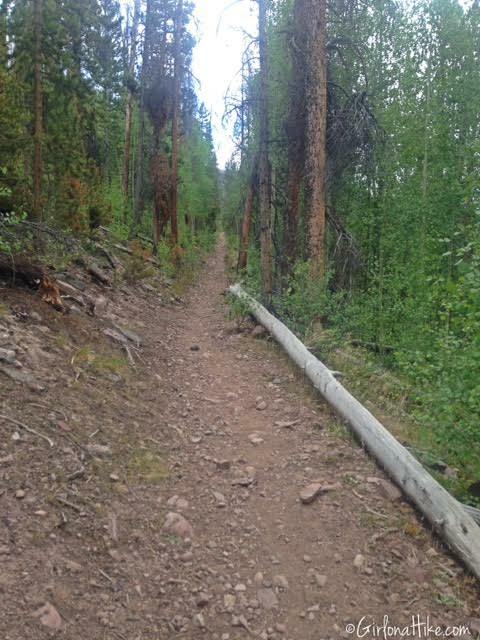 Eventually the trail drops into the East Fork Smiths Fork drainage, by following a few switchbacks downhill. You'll see what looks like a trail veering off to the right, through some shrub. However, that is NOT the correct way (it's a game trail). Stay on the path that wraps around the base of this hill, to the left, following the cairns. 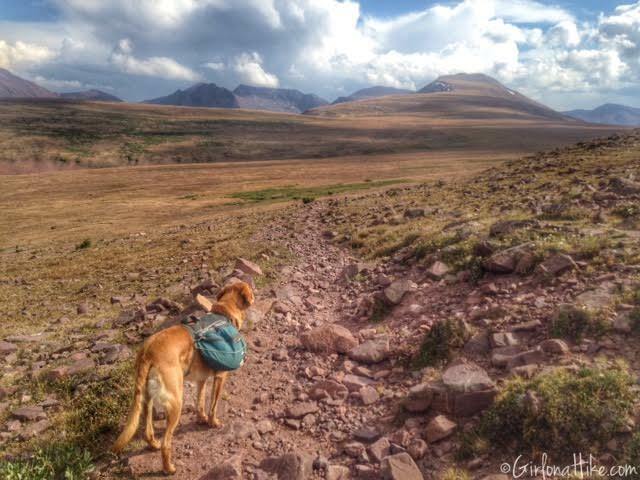 I always say, "If you don't see any horse poop on the trail, then you aren't on the right path in the Uintas." 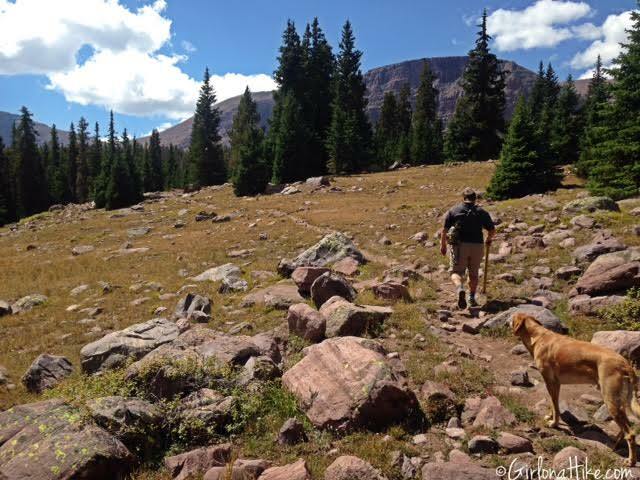 The last 3 miles to Lower Red Castle Lake are pleasant, rolling hills through a mix of forested and meadow areas. 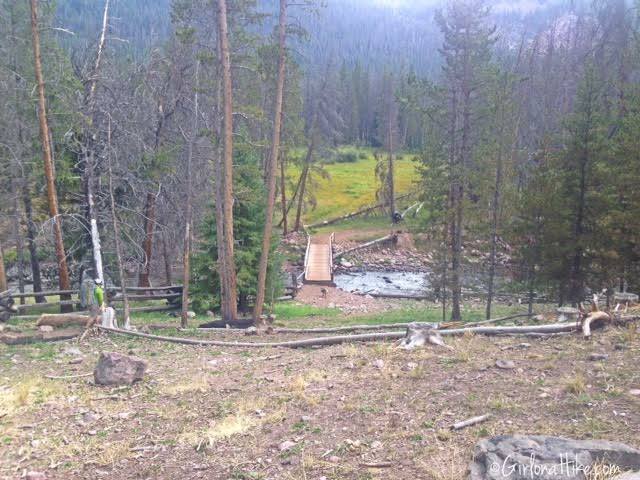 There are plenty of good camping spots in this section, however, water may be scarce. 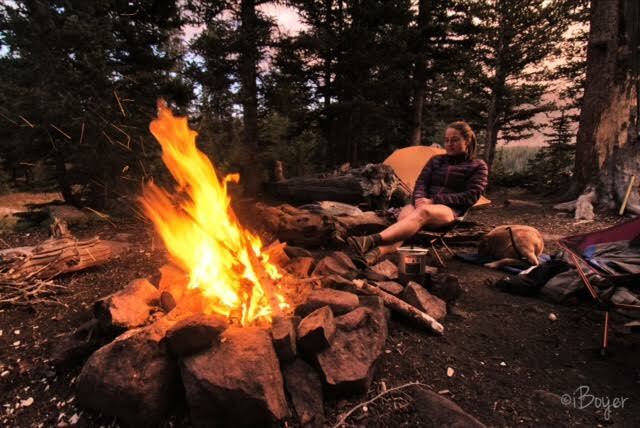 It's best to reach the lake or river before setting up camp. 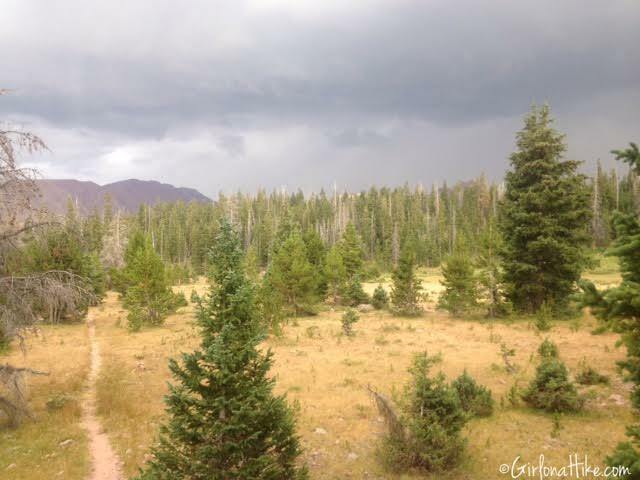 You can see from the dark clouds, the typical afternoon thunderstorms had arrived in the Uintas. 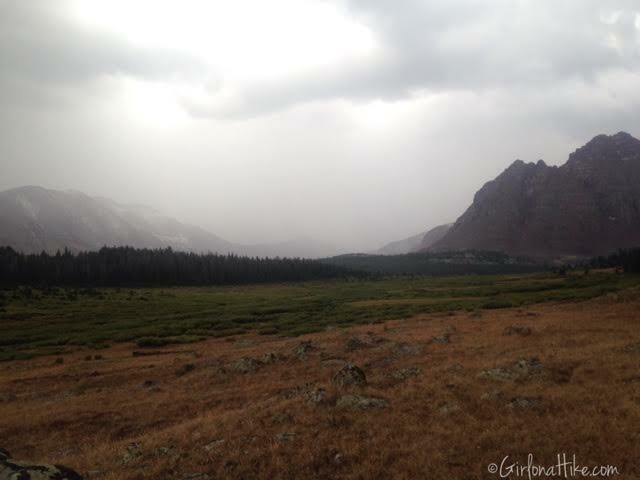 It started to lightly rain, and in the distance on the ridge and Red Castle Peak, it actually got light snow! 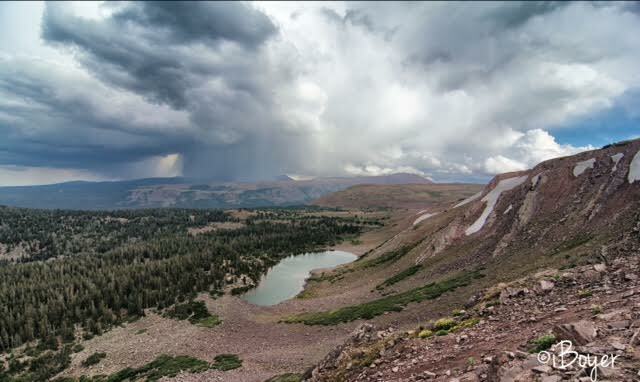 The Uintas are known for afternoon thunderstorms, and it can snow year round at this elevation. Always be prepared for any kind of weather. The light snow socks in the East side of Red Castle Peak. Time: Half day. We took our time exploring and fishing. The next day we woke up to beautiful, deep blue skies and puffy clouds. 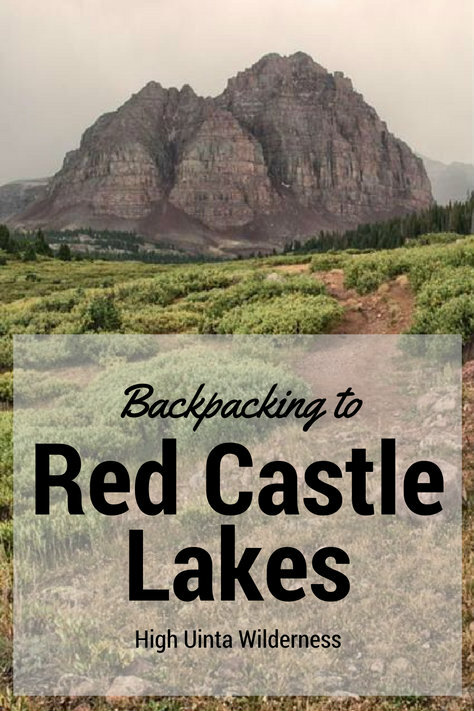 We began hiking to the main Red Castle Lake around noon, since the best time to photograph Red Castle is in the afternoon/evening light. 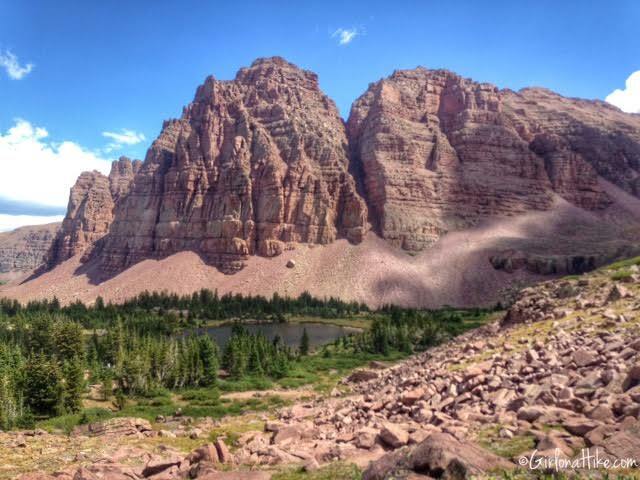 Hiking above the unnamed pond, and a great view looking at the West face of Red Castle Peak. The beautiful Red Castle Lake! We decided to hike all the way to Upper Red Castle Lake - this was the view looking back down on the main lake. Fishing was good at the upper lake, mostly 10-13 inch trout. The next day we headed back along the same trail we took to get here. Coming in we didn't see a single person, but on the way out, we passed 7 people. 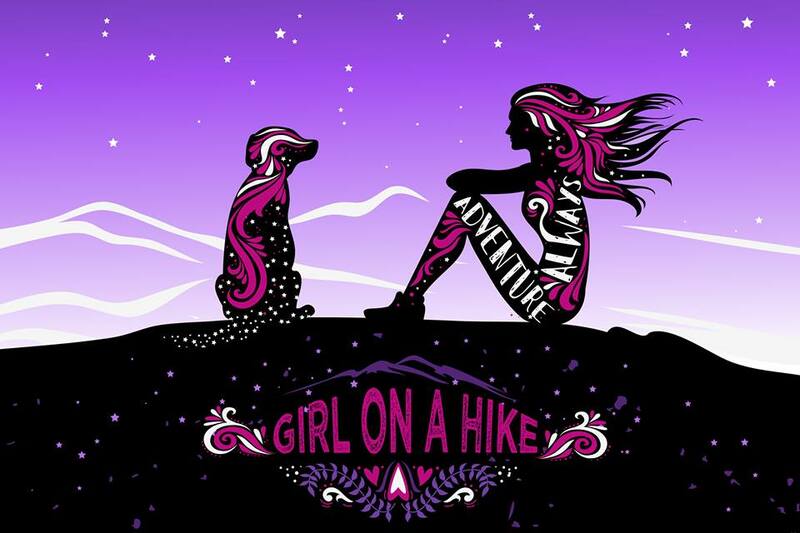 Great story of your hike. 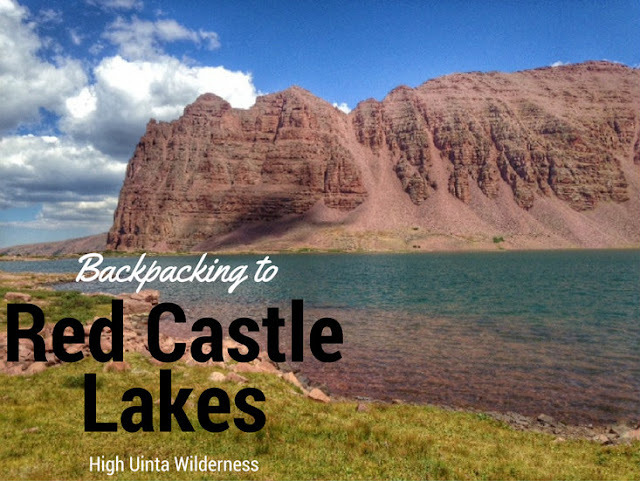 I've taken my children for the last 25 years to various places in the Uinta's but Red Castle has always been special. 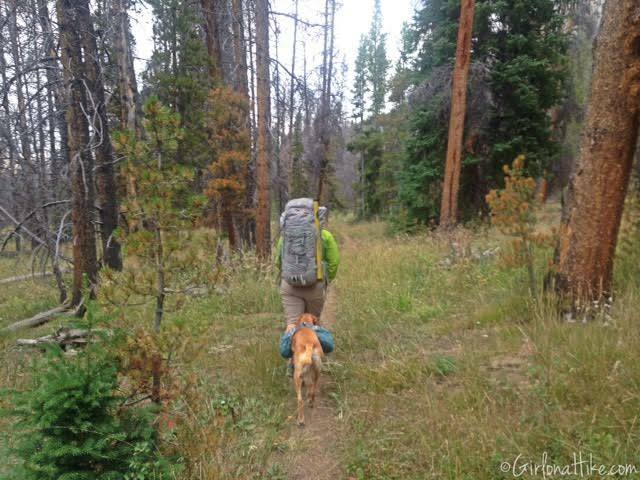 We hiked up the valley mostly, but we've also done the East Fork of the Blacks Fork trail. However, we did a loop, up to Bald Mountain, to East Red Castle, Smith's Pass, then over to Tungston Pass, Porcupine Pass, Squaw Pass, then down the Little East Fork to the parking lot where we started. Great hike. 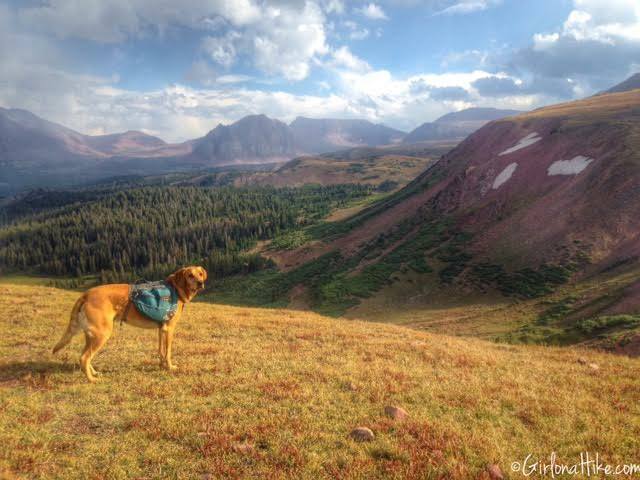 What time of year did you do this hike? I'm planning on heading up there over the 4th of July weekend. My wife and I are looking to head to either Red Castle Lakes or Rock Creek Basin / Gladys lake next week and cant decide which to shoot for. We are doing a 2 night trip and both areas seem to be beautiful with plentiful fly fishing. Which would you suggest if you could only do one? We are travelling in from Tennessee. Hoping to go next week! What worked best for catching fish on the upper lake? Spinners?